205: Nothing sweeter than a good friend…..
especially when that friend is the queen of Sis Boom herself…Jennifer Paganelli…Last spring at Quilt Market, Jennifer and I discussed me doing the promo quilt for one of her next lines….which at the time were going to be two and with completely different names than what came out …. but So St. Croix is so Jennifer! Here is something….on the design wall…I really had it all planned out already…I just needed a place to hang it temporarily…what a mess!! When I drew this up back in May last year, Jennifer’s newest lines at the time consisted many more colors. This line is pretty much just two…blues/greens and pinks…it is almost as if it was made for this idea. 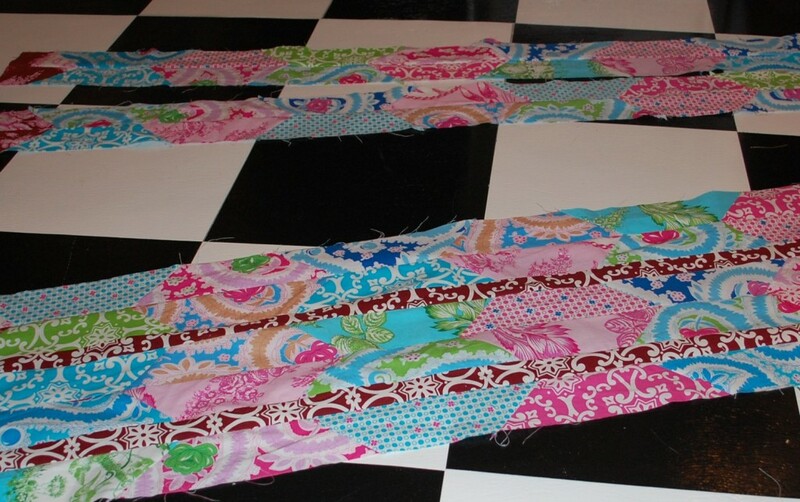 I have just loved Sis Boom fabrics ever since she came out with Girlfriends back whenever that was…. (or did she have a line before that?? I didn’ t know her back then….so glad to know her now) so I was VERY delighted to get this chance to work with her designs before anyone else does!! So the top is all done, I am hoping to quilt it up this weekend and then get the binding on and the directions written up…should be avaiable online in a couple weeks…The fabric might be hitting the stores right now…I am not sure…pop on over to Jennifer’s and ask her…she’ll know for sure. And wish her a happy Birthday. I think it’s today…tell her Scott at the Blue Nickel sent ya!! To all my dear contest winners of the last couple weeks….uh….your prizes are still sitting in a box on my studio floor…I don’t have all of your addresses yet anyway, but I do want to get this stuff sent out to you soon….I have had a couple new gigs come up, and the usual trauma of life and general business have been swirling here in the very grey-green of the Pacific Northwest…. so thanks for your patience, good people…and look to the west for a mailing from me one of these days. Until next time, my very best wishes to you and yours….and a hundred thousand prayers for Haiti tonight….. Thanks for letting us see part of the process for your quilting, I too think this line is very Jennifer! Can’t wait to see it after the backing is on and quilted! Fantastic! 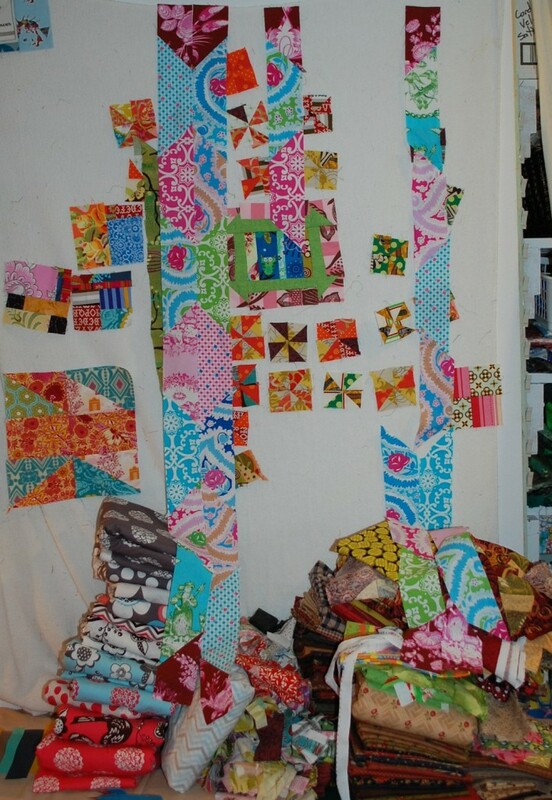 Love Jennifer Paganelli, Sis Boom, and love what you have done with the quilt! Oh Jennifer is my absolute favorite fabric designer!! Love, love, love her new fabric!! Thanks for giving us a peek! BTW, the quilt is beautiful! Wow, what an eyepopping fabric line and quilt! Love it! nice quilt! i love the photo of the whole mess up on the design wall! 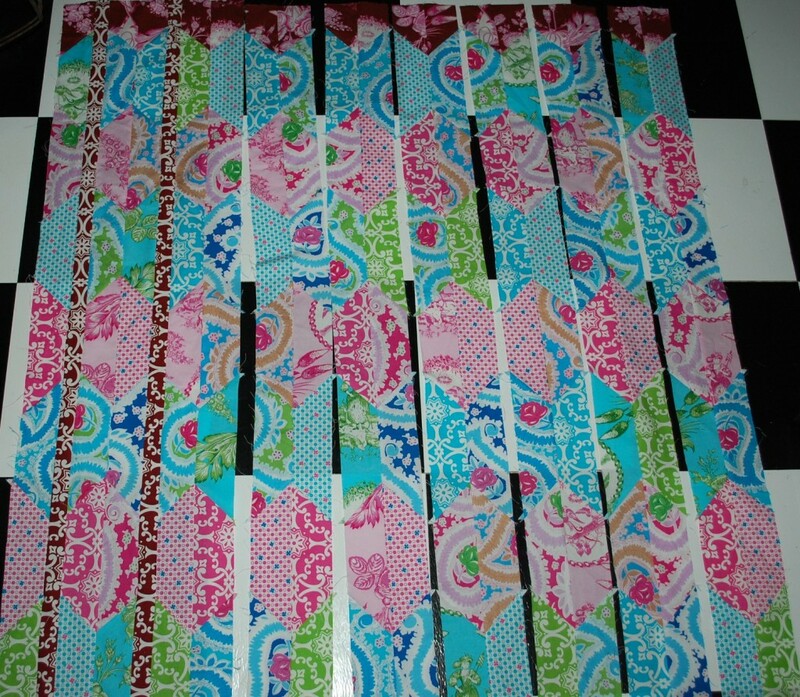 I like how you lined up the colors in rows to make a new pattern. neat quilt top. Thanks for sharing. Looks great! What a fun line to work with. ‘Girlfriends’ is also what drew me to Jennifer, way back when. I’ve been a fan ever since. Another beautiful quilt top Scott. I adore the edge triangles in brown and pink…scrumptious!